Military writers who have contributed to "Proud to Be: Writing by American Warriors, Vol. 2" will read at two St. Louis-area book-release events Fri., Nov. 15, 2013. Both events are free and open to the public, and the hot-off-the-press books will be available for purchase and signing. The second of a series made possible through the efforts of Missouri Humanities Council, Southeast Missouri State University Press, and the Warriors Arts Alliance, this issue of "Proud to Be" delivers fiction, non-fiction, poetry, interviews, and photographs by more than 70 military service members, veterans, and families. Fri., Nov. 15, 7 to 9 p.m.
We only hear the news media’s coverage, maybe a few oral stories from friends and family [...] The anthology format preserves not only the individual pieces of writing, but also the multiple opinions and viewpoints of involved human beings, all in one artifact. 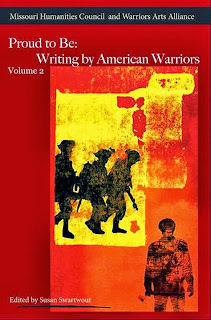 The printed anthology informs the public, allows the soldiers’ and their families’ voices to be heard, and preserves their writing. Triple win. "Proud to Be, Vol. 2" is available for pre-order as 320-page trade paperback through the Southeastern Missouri State University Press and through Amazon. For a 13-page, PDF profile and sampler of "Proud to Be, Vol. 2" content, prepared by the Missouri Humanities Council, click here. The 256-page first volume was published in November 2012, and is also available via Amazon . A call for submissions and contest for "Proud to Be, Vol. 3" has been issued. Deadline is June 1, 2014. Also currently located at the University of Missouri–St. Louis's Mercantile Library is a special art exhibition titled "War and Healing: Artwork from the Combat Paper Project." The exhibit runs Nov. 1, 2013 to Jan. 6, 2014.